March 11, radioactive fallout from the reactors in Japan hit California. I suspected that after crossing the Pacific, not that much radioactive dust would be left, but you never can tell. We get measurable amounts of pollution from China. So I went on the internet to see what I could find. The first thing I found was a website that posts radiation readings. Here's what the map looks like. Readings above 100 are supposed to be worrisome. California never got much above 30. The reason I wanted to know in the first place was that it was raining and I was going to go paddle my kayak and I didn't want to do it if there was going to be a bunch of radiation coming down with the rain the way it did in Kiev after Chernobyl blew up and the people were just walking around in the rain because nobody told them that there was a problem. The way the site works is that they have people all over the country hook geiger counters up to their site and then they display the readings on that map. 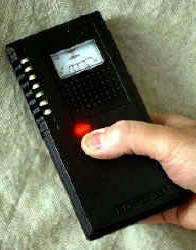 The site also lists a bunch of geiger counter models that their software is compatible with. So I looked one of them up. Mostly I was curious what it would cost to have your own geiger counter. The pocket sized DX1 model is only $259. Not bad. Only thing is, they're all sold out. Seems like curiosity about radiation levels is way up. Update 3/25/11, 8:30 A. M. It will be weeks to months before we will have Geiger Counters for sale again - sorry! Read below. Update 3/17/11, 5.03 A.M. We are no longer accepting orders for Geiger Counters of any sort. If you have already placed an order, it will eventually get filled, in days, weeks, or months, depending on when you placed the order. If not yet filled, your credit card has not been charged, and will not be charged until your order is ready to ship, and you may cancel your order at anytime up until then (do so by email only and put the word Cancel in the subject line). We are generally not answering emails, and if you must contact us, make sure it is urgent, and call us by phone, but please be advised that the time we spend on the phone takes away from order fulfillment. Thanks. Yikes, looks like the geiger counter folks are going to have windfall profits this year. It also tells me that a number of people don't trust their government or their TVs or the internet, all of whom have put out fairly reassuring messages, i.e. nothing to worry about.